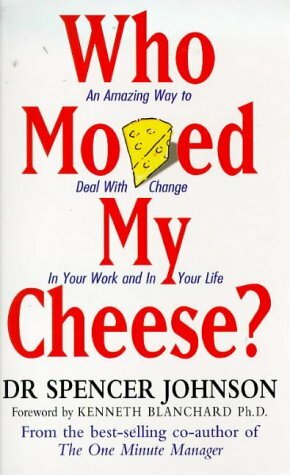 Television Lady: Who Moved My Cheese? This is probably the most ridiculous thing I've ever read, right up there with Men Are From Mars. . . . I felt the same way about it then. This book is for all the executives of the companies who are going to need to be outsourcing and laying off in the up-and-coming bad economy months, and they can just give this book to the people they're going to can. It's written in really childish language and it has a great moral dilemma to it that these peons will appreciate and this will make them forget all about being laid off. What this book does is throw it back in their court: it's not the businesses that are at fault by laying people off and eliminating jobs, it's the PEOPLE's faults. They need to learn to not have expectations; we need to try to explain to them that having expectations makes them lesser humans. They need to realize that everything negative that happens to them is actually deserved by some weakness within themselves. Just insert the pink slip INSIDE the book and leave it in the employees' mailboxes. oh for piss sakes. it was so bad. it was sitting in the shelf at work and I brought nothing with me to read so I had to take it down and look at it. My outsourcing pink slip came with a copy of "The World Is Flat" Talk about a crappy book!